Psychologist Paul E. Joffe, chair of the suicide prevention team at the University of Illinois at Urbana-Champaign, contends that at bottom binge-drinking is a quest for authenticity and intensity of experience. It gives young people something all their own to talk about, and sharing stories about the path to passing out is a primary purpose. It's an inverted world in which drinking to oblivion is the way to feel connected and alive. Wouldn't that be a clue as to effective prevention methods? A standard "drink" then is 12 ounces of beer or wine cooler, 8 ounces (1 cup) of malt liquor, 5 ounces of wine, or 1.5 ounces of 80-proof distilled spirits. The general rule of thumb used in defining "moderate drinking" is one standard drink per hour, no more than three standard drinks in a 24-hour period, on no more than two occasions in any seven day period. The body can metabolize (process or break down) 1/2 an ounce (or 14 grams) of ethanol per hour, which works out to a decrease of about BAC 0.015 per hour. Recall that a "standard" drink contains 12 grams of ethanol. That means the average person can metabolize about one standard drink per hour. For every drink a person consumes, he or she must let an hour pass without taking in any more alcohol before being sober. A recent study found that college kids routinely overestimated what is a standard drink--by an order or two or more. 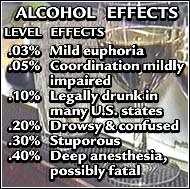 If Joe College says, "I had four or five drinks", the actual alcohol load taken on might be 5 ounces of ethanol, or 10 drinks. If Joe College weights about 170 and rammed that down in two hours, his BAC might be 0.10 or more. If you are at a keg party , the cups are either (commonly) 16 or 22 ounce cups. These are often used for mixed drinks as well. The blood alcohol charts at Brad 21 will help you understand that the kind of drinking on campus isn't "moderate" or "social" drinking--it is designed to get the drinker into an altered state of consciousness. Unfortuately, that can lead to death. Rapid binge drinking (which often happens on a bet or a dare) is especially dangerous because the victim can ingest a fatal dose before becoming unconscious. The Iowa State blood alcohol concentrations are also very helpful. Emergency Medical Services Authority notes the symptoms of potentially fatal alcohol poisoning: Mental confusion, stupor, coma, unable to rouse the person. No response to pinching the skin. Drinking black coffee, taking a cold bath or shower, or sleeping or walking it off cannot reverse alcohol poisoning. The victim must have immediate medical attention. Call 911, stay with the victim to prevent him choking on vomit, and tell emergency personnel how much alcohol the victim drank. There are a number of foundations that memorialize young people who have died of alcohol poisoning. Taylor Webster memorial foundation. Taylor died of alcohol poisoning at age 19-- Now his family and friends are working to get the message out, telling their stories and providing information on alcohol poisoning and the signs and symtoms of alcohol poisoning in hopes that lives will be saved. Bradley McCue's memorial foundation. On November 5, 1998 Bradley turned 21. turned 21. He celebrated his birthday in a way that has become increasingly popular, drinking "his age in shots". That amount of alcohol was lethal and he died that night of alcohol poisoning.